Criminalize Conservatism: Does Watching Fox News Turn You Into A Conservative? Does Watching Fox News Turn You Into A Conservative? Many of us can't stand listening to Hate Radio or watching Faux News, but there's a new study out that tells us one of the reasons: we may be getting proselytized without knowing it. "Yes, watching Fox does make you more conservative." "Watching MSNBC makes you more liberal. "What decided the 2000 election? A few hanging chads? The Supreme Court? Or was it Fox News...? "...(W)atching four more minutes of Fox a week makes you 0.9 percentage points more likely vote Republican, while watching MSNBC for four more minutes makes you 0.7 percentage points more likely to vote Democrat. "Other researchers have analyzed Fox's effect on voting, he said, but the new study examines data from more channels over a longer period of time, with more detailed data..."
"Fox Host ReTweets Unbelievably Racist Lie About Black Protesters." "Goodness this isn’t what Montgomery Bus Boycott or Woolworth sit-ins were about -this is ignorance #blackbrunchnyc pic.twitter.com/ewRbXOi1Sx"
...but others find it extremely likely, given the fact that Fox is the GOP's mouthpiece. 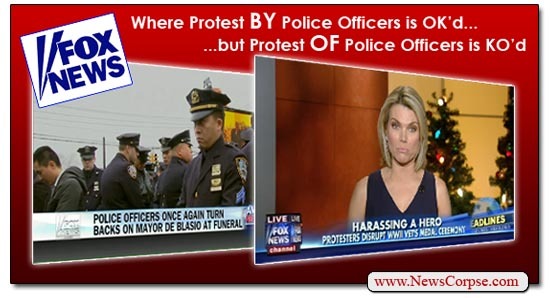 "On Fox News: Protest BY Police is Honorable. Protest OF Police Is Pathetic." 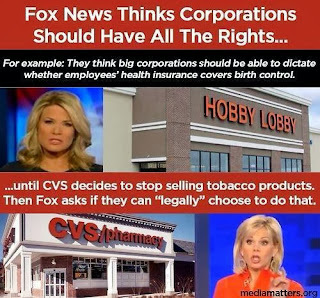 "In another example of the acutely schizophrenic and brazenly prejudiced approach to journalism practiced by Fox News, two recent stories have revealed just how blatantly they peddle their hypocrisy. "When members of the New York Police Department decided to express their political grievances with New York Mayor Bill De Blasio, they orchestrated the profoundly disrespectful tactic of protesting during the funerals of murdered officers. It was a repulsive strategy that heretofore was only engaged in by the nauseating disciples of the Westboro Baptist Church, whose protests at the funerals of American soldiers were repudiated by just about everyone across the political spectrum. "For some reason, Fox News, and other conservative media, flipped 180 degrees and voiced their support for the officers who turned their backs on the Mayor, turning events that were supposed to be memorials to slain colleagues into political rallies. The majority of Fox pundits and guests (including Bernie Kerik, the former New York Police Commissioner and convicted felon) had no problem with this display of self-serving partisanship at such solemn occasions. "Cut to a town hall in Oregon where a 100 year old World War II veteran was to receive a tribute for his service. During the event a group of citizens paraded through the room chanting 'I can’t Breathe,' the iconic last words of police chokehold victim Eric Garner. Video of this protest was aired on Fox News along with a scornful commentary by anchor Heather Nauert who called the spectacle 'Unbelievable,' while an on-screen graphic condemned it as 'Harassing a Hero.' On the Fox News community website Fox Nation, they posted the item with the headline 'PATHETIC: Ferguson Protesters DISRUPT Ceremony Honoring 100-YEAR-OLD Veteran...'"
...and according to their fearless leader, it's no problem at all. "Report: Roger Ailes Started Planning Fox News While Working for Nixon." "A Plan for Putting the GOP on TV News," the 41-year-old memo that Cook says was a lynchpin in a "nakedly partisan 1970 plot by Ailes and other Nixon aides to circumvent the 'prejudices of network news' and deliver 'pro-administration' stories to heartland television viewers." "Detailed accounts of Ailes's day-to-day activities while working for the White House. Cooks says, "[Ailes] reveled in the minutiae constructing political spectacles—stage-managing, for instance, the lighting of the White House Christmas tree with painstaking care…" There's a drawing included and instructions for Nixon not to let a six-year-old boy get credit for lighting the tree. "A note from Watergate felon and Nixon chief-of-staff H.R. Haldeman promoting a Ailes' idea for the president to host live Q&A sessions in high schools and colleges. You might remember that when Barack Obama did this recently, Fox News called it a ploy to "indoctrinate children to support him politically." "Read the report in full here. The problem with Fox isn't only the word "news." The first problem is that they are an arm of the Conservatives and don't have to disclose that they are really partisan hacks. The second problem is the evil of Conservatism itself. Conservatism is the "political philosophy" that the rich should rule and the rest of us will provide the labor in their New American Age of Feudalism. 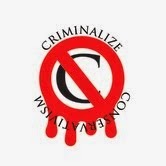 ...and that is to criminalize Conservatism NOW. Joyce, Jnr. Fox News host Sean Hannity (October 2009).